Tameer’s 91 floor Elite Residence, ideally located in the heart of Dubai Marina with stunning views of the Palm Jumeirah Islands, is destined to become one of the most exclusive and sought-after addresses in the Middle East. Construction has been underway since 2008 and is now in the completion stages. 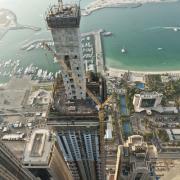 To execute this challenging high-rise project, building contractors relied on Doka, The Formwork Experts. The post-tensioned slabs, downstand beams and the exterior columns have been built at record speed using the efficient floor system Dokaflex tables in combination with the wall system Large-area formwork Top 50, which is lifted using the high-capacity automatic climbing system SKE 100, the crane-independent climbing formwork for structures of any shape and height. 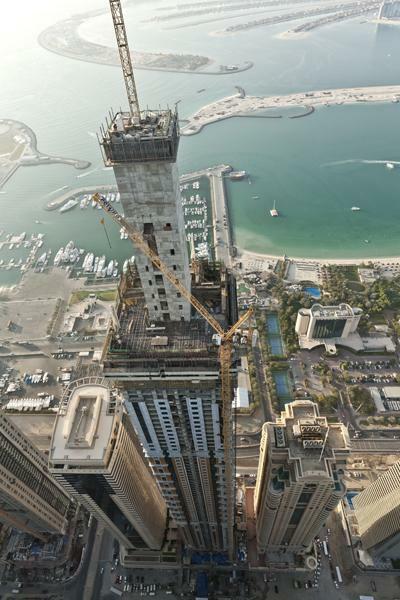 To meet the ambitious timetable of a five day cycle, Doka Gulf’s Abu Dhabi branch worked with the main contractor Arabian Construction Company (ACC) to design a formwork workflow which would allow splitting of the punctuated façade into two zones by climbing one zone always one floor ahead of the other one. This speedy workflow in combination with a well-organized construction site enabled the most-effective method for erecting the high-rise building. Different work teams were shifted from one zone to the other without any standby time. For this challenging construction project, Doka engineers planned a flexible solution which enabled quick and easy adjustment of the formwork to the changing geometry of the structure. With the versatile Large-area formwork Top 50, the constant geometry changes were incorporated into the formwork design and therefore were easily accomplished in very little time. Furthermore, the formwork for the outside of the downstand beam and the complete column formwork consisted of the same formwork element. The L-shape side panels for the columns were integrated into this element and could be hinged back to facilitate climbing up and shifting of the formwork. With only two different sizes of Dokaflex tables for the slab and one for the bottom support beam, Doka optimized its formwork solution to have a simple system that kept work onsite moving rapidly throughout the project. With the Doka shifting trolleys for horizontal repositioning and two Table Lifting Systems TLS, the tableforms could be moved up to the next floor in a quick and safe manner independent of the crane. By repositioning the Dokaflex tables with the fully automatic remote controlled TLS, the entire site workflow was optimized for maximum speed and efficiency. In cooperation with the cladding company Cladtech and the main contractor ACC, Doka designed an innovative method of installing the façade panels on the existing concrete structure. Doka provided an additional suspended working platform to enable Cladtech to integrate their dual rail system and further to use the platform for preliminary works i.e. installation of adapters for the façade panels. Thank you for your interest - Elite Residence Erected in a 5 day cycle. Thank you very much for your interest - Elite Residence Erected in a 5 day cycle.